The Slovak Republic has adopted the European Commission definition of a rare disease. However for the purposes of reimbursement the frequency should be less than 1 in 10,000. A National Plan for rare disease patients in the Slovak Republic covering the years 2016-2020 was prepared by a multi-stakeholder advisory group for rare diseases (which included patients), at the Ministry of Health of the Slovak Republic. It is based on the National Strategy for the Development of Healthcare for Patients with Rare Diseases for the Years 2012-2013, approved via Act 578/2012 of the Slovak Government. 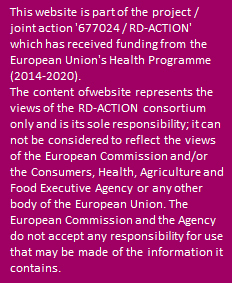 The EUCERD criteria form the basis of both these documents. The budget for 2016-2017 is €240,000, however the costs of the activities detailed within the NP are incorporated into the general budget. The National Plan 2016-2020 defined 9 priorities. Each year, the extent to which the priorities have been fulfilled will be evaluated and the need for further activities will be updated. Neither national nor regional rare disease registries exist in the Slovak Republic at present, but disease specific registries are available. In terms of coding, ICD10 is obligatory for health care professionals and providers; however for the purpose of registering rare diseases, OrphaCodes are now being introduced. There is no policy in place at present for the designation of Centres of Expertise (CEs) for rare disease within the Slovak Republic. Since CEs do not formally exist in the Slovak Republic, no national process has yet been agreed to support membership of HCPs in European Reference Networks. Genetic tests exist for 96 genes and for 114 rare diseases (excluding gene panels). There is no special policy in place pertaining to Cross Border Genetic testing, which is handled by Central Laboratories: a request for a special examination or test is assessed on a case-by-case basis, by health insurance companies. Currently, the Newborn Screening programme in the Slovak Republic offers tests for 23 diseases, and is obligatory for all infants in the Slovak Republic. The Slovak Republic has no specific programmes or projects to fund or facilitate rare disease research. 15 Orphan Medicinal Products (OMPs) are directly available in the Slovak Republic: information regarding these products is publicly available through the Ministry of Health website, and forms part of the list of priced/reimbursed drugs, which is updated on a monthly basis. There are measures in place to facilitate access to OMPs, such as a compassionate use programme; however, obtaining OMPs through this method apparently entails certain administrative and legal obstacles.